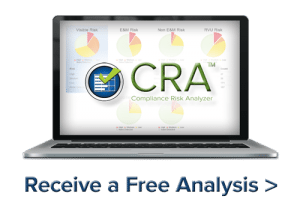 Compliance Risk Analyzer® (CRA) is a true risk-based auditing tool that delivers an effective, efficient, accurate and rapid identification of potential risk for every single provider in your healthcare organization. The key is that all CRA risk assessments are distilled to a straightforward scale of 1 to 100. You can quickly rank risk within and between categories on the high-level summary report. Work on real issues right away – CRA creates an audit plan of the top five critical risk issues for each provider reporting a moderate to high risk. Rather than using your limited resources to search for potential risk issues by conducting initial probe audits, direct them to validating real risk. Our audit action plan is based on a statistical review of 100% of your claims — something that is virtually impossible any other way. CRA was developed by The Frank Cohen Group, a division of DoctorsManagement.